Be16 only interfaces with Bernini Design generator controllers. It features an RS485 port that supports MODBUS and an RS232 port to communicate with MODEM. It provides also a regulated power supply for the MODEM. All functions are controlled by a 16 bit microcontroller that decodes SMS coming from mobile phone and drives functions via MODBUS. The Be16 features LOG-IN LOG-OUT function to limit the access to the system. 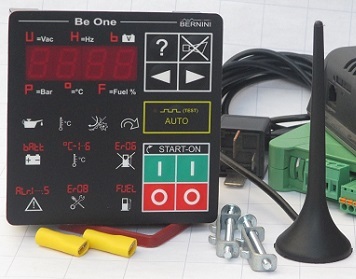 On the front panel, four LED indicators inform you about the BE16 status. In this example, you can monitor a generator equipped with BE124 generator controller. You can control the status of the generator panel and remotely start stop the generator. Connect the Be124 Controller  to a BE16 Module  by using an RS485 twisted pair  (max. 1000m). Connect the Be16  to a MODEM  by using an RS232 cable  (max 10m). Follow the setting up instructions for the Be16 to get connected to your generator in real time via simple and intuitive SMS commands. The Be1 controller is an user friendly module suitable for small to medium size power generator. It interface with gas & gasoline engines. Be1 features a wide range of operation thanks its high luminosity, industrial grade, 4-digit LED display. It features IP65 thanks to a silicon gasket. The metal enclosure provides exceptional protection against electrical interferences. In this example, you can simultaneously monitor your BEK3 AMF panel and standby generator by using a mobile phone. You can control the status of the panel and you can transfer the load to Mains or Generator and vice versa. Connect the BeK3 AMF ATS Controller  to a BE16 Module  by using an RS485 twisted pair  (max. 1000m). Connect the Be16  to a MODEM  by using an RS232 cable  (max 10m). Follow the setting up instructions for the Be16 to get connected to your generator in real time via simple and intuitive SMS commands. You can control the status of the panel and you can transfer the load to Mains or Generator and vice versa. Connect the Be142 AMF ATS Controller  to a BE16 Module  by using an RS485 twisted pair  (max. 1000m). Connect the Be16  to a MODEM  by using an RS232 cable  (max 10m). Follow the setting up instructions for the Be16 to get connected to your generator in real time via simple and intuitive SMS commands. In this example, you can simultaneously monitor your BE142 AMF panel and standby generator by using a mobile phone. [NAME] is the ‘name’ of the controller. In case you use the Be124 controller the default [NAME] (in other words the name when the controller is used for the first time) is [BE124]. The purpose of the name is to provide security of the communications. As a matter of fact, you can change the name at any time (example [MYBE124] or [HOME GENERATOR]). Only an SMS that matches the name in the memory of the Be124 can be taken into consideration by the system. SMS commands with different [NAME] will be ignored. In this tutorial you will find how to change the [NAME]. [COMMAND] is the name of the command to be executed by the generator controller. For example [STOP] (it stops the engine). The following table lists the available commands for the BE124 generator controller. Please note that you can use upper or lower case letters: [STOP], [stop] or [Stop] have the same function. Connect Be16 supply terminals to the engine battery. Connect the cable supply to the modem supply connector input. Connect the RS485 cable to Be124. Connect the RS232 serial interface cable to the modem. -change the default name of the controller. After that, every time you send a command that control the generator, the controller will ask your credentials (so called LOGIN procedure).